Haven | gURROO - A new generation of innovative minds. Haven is an individual, wellness pod providing a sanctuary from our busy, demanding lives. It offers stress relief in two ways, either used as a relaxation space playing personalised imagery and music, or via a therapy session, using biofeedback techniques in conjunction with a therapist through a virtual link. This dual use concept maintains a sense of anonymity and privacy, which would not be possible in a dedicated therapists’ office. The individual pods and surrounding environment are immediately much less stressful than appointments in traditional clinics, while the curved, organic shape creates a cosy, relaxing environment. Haven is a modular unit with a small footprint, allowing it to be positioned in airports, malls, parks, or large workplaces. The impact of virtual technology on this design, is that by creating a virtual world inside the space, there is no need for specific locations, potentially using traditionally undesirable space. 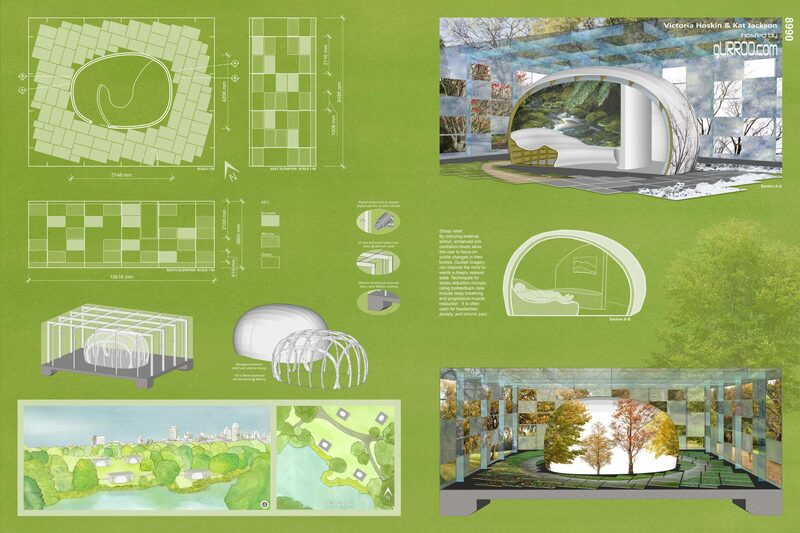 Our location of Central Park, New York, has however been chosen to enhance the stress reduction potential of the pod. 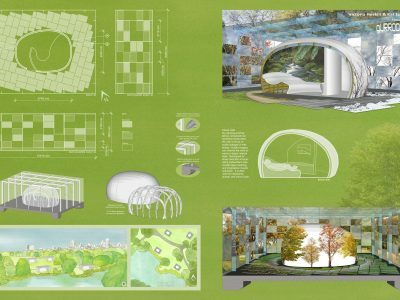 This allows the user to gradually leave the chaotic city behind and adjust to a calmer environment. 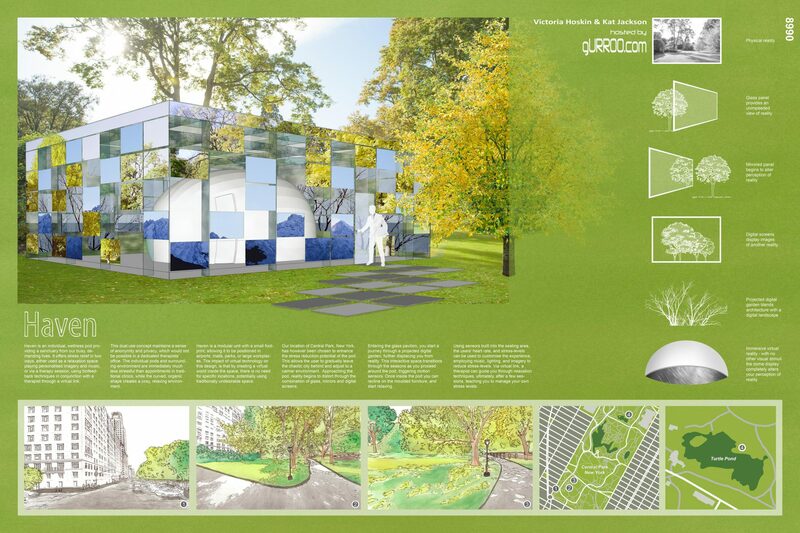 Approaching the pod, reality begins to distort through the combination of glass, mirrors and digital screens. Entering the glass pavilion, you start a journey through a projected digital garden, further displacing you from reality. 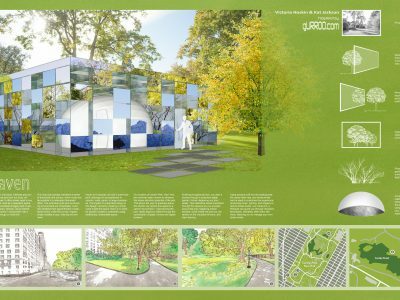 This interactive space transitions through the seasons as you proceed around the pod, triggering motion sensors. Once inside the pod you can recline on the moulded furniture, and start relaxing. Using sensors built into the seating area, the users’ heart rate, and stress-levels can be used to customise the experience, employing music, lighting, and imagery to reduce stress-levels. Via virtual link, a therapist can guide you through relaxation techniques, ultimately, after a few sessions, teaching you to manage your own stress levels.